Remember when global warming was going to increase Malaria? Never mind… | Watts Up With That? In the visualisations below we provide estimates of the total number of deaths from the World Health Organization (WHO) from 2000 to 2015, and the Institute of Health Metrics and Evaluation (IHME), Global Burden of Disease (GBD) from 1990 to 2016. These estimates are notably different across various countries which affects the total number of reported deaths. IHME figures, as shown below, tend to be higher; they report deaths greater than 720,000 in 2015 versus only 438,000 from the WHO. Further information on the confidence intervals of WHO estimates, and a country-level comparison between these two sources is covered in our section on Data Quality & Definitions. Since the beginning of the 21st century, the WHO has published global estimates of the number of people that die from malaria. In these 15 years the global death toll has been cut in half: from 839,000 deaths in 2000 to 438,000 in 2015. Africa is the world region that is most affected by malaria: In 2015, the African continent held 9 out of 10 malaria victims (click on ‘Expand’ to see this). But Africa is also the world region that has achieved most progress: from 2000 to 2015, African deaths from malaria were reduced from 764,000 to 395,000. The Institute of Health Metrics and Evaluation (IHME) provide estimates of malaria deaths from the year 1990 onwards. Over this period we see a clear rise-peak-fall trend, increasing from around 746,000 deaths in 1990; peaking at upwards of 990,000 in 2003; and then declining (although at varying rates) to around 720,000 in 2016. These estimates are notably higher than those of the WHO (see Data Quality & Definitions for further details). Although divergent on the total number of malaria deaths, both the IHME and WHO estimate that 90 percent (9 in every 10 deaths) are from the African region. The end result? Mann’s 1.8 million Malaria grant – “where do we ask for a refund’? You can fool all the people all the time as long as fact checking comes later and only to limited audiences. Are they still teaching him, or has he been banned because of offensive racial terms? They switched to the Winston Churchill version for awhile until he too was banned. I blame this on the illiterate female mosquitoes that did not read the previous “research projections”. They’re not illiterate, they’re deniers. Seriously, maybe we should start thread on all of the “Global Warming” predictions that have come to pass. OK, that’s all I’ve got so far. Has the data for the earlier years been adjusted downward yet? People “not dead” are impossible to count as well. Yet somehow they manage to get out and vote Democrat year after year. Erm,, as for point 1 can I fill in the gap? ….. Ok I’ve tried. Nope, can’t think of anything either. Well, they have predicted that it will either make things better, worse or have no noticeable effect. I guess that prediction is true if it indeed is any sort of a prediction at all. That 1.8 Million could have been used to purchase DDT; instead it went to someone that doesn’t care how many tens of thousand s die. Africa has managed to halve its deaths from Malaria using nothing but mosquito netting “generously” supplied by WHO. Imagine the decrease if they were allowed to use DDT! They are. The WHO has allowed it for some time now and it has been a significant contributor to the decline. According to a group of Nigerians I met at a climate conference recently, they are NOT getting DDT, only the nets. Also, they would like to electrify their country by burning the coal they have in abundance but the World Bank will only lend money for renewable power sources. I did share with them the recipe for nicotine insecticide. Article from 2004 – you will enjoy the read. Was on safari in Botswana recently. Safari tents were generously supplied with DDT spray cans of a product labeled DOOM. Mostly true. Don’t underestimate female mosquitoes – they already developed a resistance to DDT. Resist, RESIST! Recent research shows that injected methyl blue dye is harmless to humans and kills the malaria parasite pretty well completely. Going into field trials soon. I saw the methylene blue news in An American Doctor’s Odyssey: Adventures in Forty-Five Countries (1936) by Victor Heiser – but he used it to treat leprosy. Helluva job catching and injecting each mosquito. Strange the environmentalists didn’t care one bit when they massively increased malaria by successfully lobbying for the banning of DDT yet they claim to care massively when its in support of their latest pet obsession. Conversely they apparently cared massively about the safety of raptors when banning DDT was the obsession yet when the obsession is windfarms the fact that these turbines are killing raptors is a matter of no consequence. Call it hypocrisy or cognitive bias, but these folks have a very peculiar way of “saving” the planet. And don’t forget all the insect-gobbling bats that those inefficient turbines kill…. They should build tiny, tiny wind turbines which would kill mosquitoes! Why do I have to think of everything? Maybe they would also help reduce our tiny, tiny warming. Ithink i recall that one method of control of malaria was to spray a light coating of an oil onto the surface of still water ,where mosquitos breed. I believe it destroyed the suface tension so the pupal stage could not attach itself to the surface ,it would sink &’drown . South Africa only stopped using DDT for one year, during which there was a huge upsurge in cases. That put an end to that ‘experiment’. Backing up to the central premise (before this pesky, inconvenient little factoid was introduced), this claim was apparently made on the idea that malaria enabled by AGW was a bad thing, but if it’s the result of banning pesticides… well, then it’s hardly worth mentioning – even a necessary evil (unless you feel the need to cull down all those over-populated humans, then it’s just necessary). One of the worst outbreaks of malaria in the last century occurred in the Soviet Union at the end of their civil war. In 1922-23 a massive epidemic swept the Soviet Union as far north as Archangel, on the Arctic circle, killing an estimated 600,000 people. In Archangel alone there were 30,000 cases resulting in 10,000 deaths. Anyone who claims that malaria is a tropical disease which increases with temperature is probably suffering from the ague. Your comment and others following make a strong case that the reduction of malaria is more related to things like the introduction of insect screening (still rare to non-existent in Africa (Even in places like university dorms. ), and mosquito-abatement programs. In California, it was apparently the practice of early ranchers to build their homes at least a mile from major rivers, and to put the bedrooms on the second floor. So, architectural practices can help reduce infection rates. All of this requires a certain level of affluence and technology that even today is largely missing in Sub-Saharan Africa. We’ve come a long way since French Doctors treating patients during the initial attempt to build the Panama Canal put the legs of the patients beds in pails filled with water. My guess is that most here know something about Major Walter Reed, they have never heard the name William Gorgas who made the building of the canal possible. Nor would they know that William was the son of Josiah Gorgas who was a Northern born Confederate general who made it possible for the Confederacy to continue the war by building the plant and supervising it’s operations, that supplied virtually all of the gun powder their armies needed using a process much Superior to that used to produce the powder used by the Federal forces. Never fear, a new study will come out soon that will prove that Gorebull Warming is causing all of the Female mosquitoes to become Male and thus be unable to pass on the Malaria parasite. No, but they are declaring their new gender and now using men’s restrooms where they’re getting swatted like flies. Damn transgender mosquitoes. And here I thought it was the females coming out at night. Not so. It is just that they are coming out. The meme that AGW would increase malaria deaths has always been seriously flawed. Malaria deaths are NOT related to surface air temperature in any other way than the requirement at the temperature range allow for a resident population of Anopheles mosquitoes. The CDC has a map here.. The entire Eastern US is included already…yet we have no malaria (except the few cases that enter the country from elsewhere). Most of Europe is also already included. Malaria requires human carriers . . . eliminate the carriers and the disease goes away, despite the presence of potential mosquitoes to spread it. Latitude ==> The idea that tropical diseases will spread if there are more places that become warm enough to consider them tropical is based on — really — simple misunderstandings of what actually causes “tropical” diseases. I spent more than ten years in the tropical Northern Caribbean — and had to be concerned about tropical diseases in the Dominican Republic but not a few islands to the East in the Virgin Islands. The difference? Public health standards. A sobering list. It is refreshing to see that Smallpox, Yellow Fever, Malaria, the Plague, Scurvy, the 1918 Spanish Flu, and Cholera are no longer serious threats. Malaria is Italian for “bad air” since the local belief was that somehow it was the hot muggy air that caused the disease. Italy mostly has the climate of anywhere from North Carolina to Pennsylvania. And the disease was only eradicated in the 20th century when the swamps were drained, leaving room to build Latina, and when the pumps dried out the Po river valley. Disease bearing mosquitoes don’t really care much about cold weather anyway, as long as humans build nice warm homes for the winter. All of this is known to anyone who throws even a cursory glance at the literature. Mosquitoes infected with the malaria parasite do require a certain number of days above a minimum temperature to mature the parasite so that it can be passed on. So, theoretically, a warmer planet could lead to more malaria. However, currently there are no (or very few) reservoirs (i.e. infected people) at higher latitudes and mostly good public health and vector control programs. If memory serves, malaria in Finland depended on infected Anopheles mosquitoes overwintering in homes where they got both the higher temperatures needed to mature the parasite and a convenient blood meal when they got hungry. Siberia in the summer has lots of Anopheles and is hot enough for transmission – but only if there are human reservoirs of the disease and no functioning vector control program, hence the outbreak during the civil wars. No medical entomologist that I ever met thought global warming would have any significant impact on malaria incidence. They all knew that incompetent or corrupt public health and vector control programs and the complacency of ignorance were what leads to malaria outbreaks, not slightly elevated temperatures. Ditto for Zika, Chikungunya, Dengue, and Yellow Fever – the reason these mosquito-borne diseases are spreading is because (1) human reservoirs of the diseases move around the globe and (2) the vectors (mostly Aedes aegypti, but a few others) were either never eradicated or have re-established in areas where they were once extinguished and no one in authority really seems to care enough to get rid of them. It’s not just the lack of DDT (where resistance is a problem), but a lack of will. The US was able to reduce Yellow Fever without any reliable insecticide in the 1920’s and mostly eliminated the vectors in WWII through inspection and sanitation – Aedes aegypti breeds in small accumulations of stagnant water around human habitations. Now Aedes aegypti (and the more recently introduced Aedes albopictus) are popping up all over the US. And Russia, and Ohio. Malaria is eliminated by draining swampland. Malaria was endemic in Italy until the 20th Century. But, the Romans had no problem with it. Because they knew how to drain swamps and did it. The biggest risk of malaria now is the econutters who call malaria swamps “ecologically important wetlands”. I’m wondering about the effect of drug resistant malaria on the incidence rates. There are a few places which track this, like http://www.wwarn.org/ (Worldwide Antimalarial Resistance Network), but the data is understandably spotty. Leftist money grab, using panic as a tool to manipulate. using panic as tool to control and limit individual liberty. Limiting the individual to a class or group identity is the tool to control – neoclassical marxism. I imagine the response to this is: a) those numbers are inaccurate and need to be adjusted; and b) the decline in deaths would have been even greater were it not for global warming. If I remember correctly it was Siberia that had the worst outbreak of malaria. Old joke about the Siberian mosquitoes: Two mosquitoes talking – “Shall we eat him here or take him home?” And having seen a nature film about the Siberian taiga, the cameraman was inside a mosquito net and could hardly film because of the thickness of the swarm around him! Great news Anthony….however living in England I am not sure the BBC and the Guardian newspaper will be able to take it in. Only this morning climate change is going to destroy all the great golf courses such as St Andrews et al. However if it makes it to BBC News the end is nigh. An old Russian joke. There are three kinds of news in the media: True ones, likely ones, and the rest. True ones are sports results. Likely ones are weather forecasts. The rest is everything else. This tallies with a complaint I heard from a colleague who came from the old Soviet Union. You had two main news outlets, Pravda (‘Truth’) and Izvestya (‘News’). The barb was that there was no Izvestya in Pravda and no Pravda in Izvestya. I remember my Dad saying that one should start at the back of a newspaper (Sports Results), and that as you move towards the front, the less true each page becomes. On reaching the front page – it’s total lies. It is highly interesting that UN data is used to refute UN projections. One would think that they would get their story straight. Never Mind? I’m thinking Emily Latila here! Come to think of she would make the perfect spokesperson for the Global Warming crowd. With all possible respect tp Gilda Radner. Funny how the decline coincides with the UN lifting the ban on DDT for indoor mosquito control. Carbon lied and millions died. Some people (and unfortunately, many scientists) live in a one-variable universe. For example, malaria rates only being affected by global temperature…. and global temperature only being affected by human activity – more specifically CO2. I’m a layman when it comes to medicine, but even I know that malaria rates are affected by dozens of variables. Some of which are under direct human control such as education, availability of mosquito netting and perhaps pesticide campaigns (I’m not sure but it would seem to make sense). Univariate analyses (or studies that are not sufficiently multivariate) are complete waste of time. Can anyone discuss the negative health side effects DDT generates? Are they real and substantial, or is this more alarmist p.r. that is trivial compared to the great health benefits? Gordon Edwards was known to to swallow a teaspoon of DDT before each lecture he gave on the safety of DDT. It did eventually catch up to him; he died of a heart attack while climbing Divide Mountain at Glacier National Park, where he held the unofficial title as the patron saint of climbing. He was 84 years old. See http://www.wnd.com/2005/06/31095/ for more details. None known to humans at reasonable doses. Some problems with birds as documented by Rachel Carlson. Problem is, those thinning raptor eggshell reports are not dose dependant, so a lot of uncertainty remains. Fighting again the DDT science war is very rear guard, IMO. Not particularly useful in the CAGW war. Note: skeptics lost the DDT war. Do not let that happen again. Alas, as a fan of your posts, we find occasion for disagreement. Carson’s book most assuredly galvanized “all animals are equal” crowd into action, and the UN WHO responded by banning the substance. Thereafter, Malaria deaths dramatically increased. 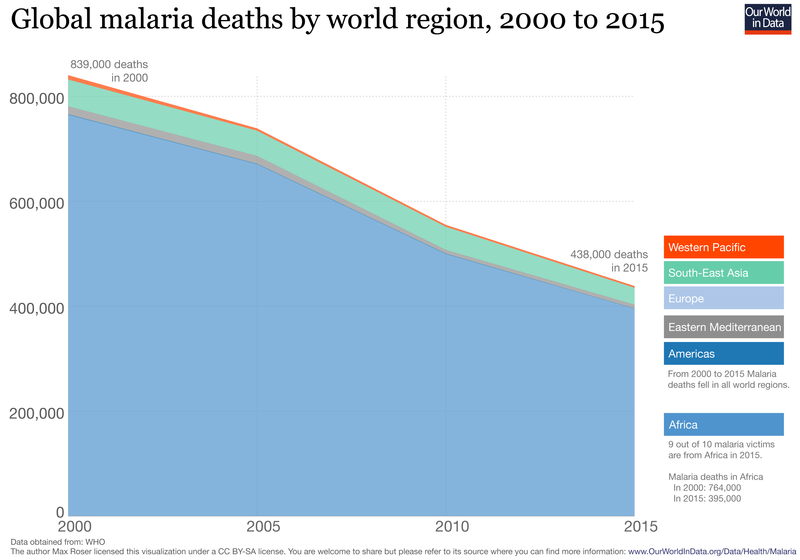 Malaria deaths dramatically decline when the ban is lifted. Obviously, this correlation proves nothing, but there’s no doubt Carson’s work is weak at best. Finally, (were her conclusions correct) how can the death of millions humans equate to the lives of x-n raptors? I have always been skeptical about those thin shells that were supposedly killing off the raptors but no other species of birds. Farmers used to shoot raptors just for the fun of it, convinced that they were preying on their livestock. Remember those old planes they used to spray DDT fog over wetlands? As kids, we used to follow them on our bikes, great sport when down the shore. So far, cancer free and I am old enough that if I was going to get it, I would already have it! BINGO! Lead was the problem, not DDT. wrote up a definitive warmunist Malaria refutation back in 2014 in essay False Alarms in ebook Blowing Smoke. Recycling false alarms just further discredits warmunists. It isn’t just mosquito netting or DDT There are other substances that are extremely effective against mosquitoes. CDC article by Paul Reiter who is no longer with them and has, since this article was written, been on the not-welcome list of AGW fanatics everywhere. All he ever did was write the truth. There is at least one superb talk that I have seen by Paul Reiter on the web, where he discusses how the international trade in second-hand car tyres is a significant vector for malarial mosquitoes. Maybe this is a better predictor of the worlds temperature. If the graph were extended to 2018 I bet it will show the latest El Nino and maybe next year the La Nino. What a disgrace those silly predictions were given that the hot spots for Malaria 100 years ago were outside of the tropics. Will this fill the papers?? Well unless you’re a s#*thole riddled with malaria and other sundry unpleasantries, ceteris paribus and all that sciency stuff. Factual accuracy is not important to these claims because they were never about the facts in the first place. A typical ‘scare story ‘their value was in the impact and PR they got , the authors knowing full well the news would long move on before people got around to dealing with the ‘facts’ of their claims. Therefore, realities ‘inability ‘ to follow the claims means nothing at all , which is standard practice in climate ‘science’ . Oddly this is how it is ‘settled ‘ in that this idea has no real reflection in reality, ‘settled ‘ is in the sense that the claim is stated not that the claim is or remains valid. Below is a plot that quantifies the number of DEATHS EACH YEAR FROM MALARIA – between one and two million. 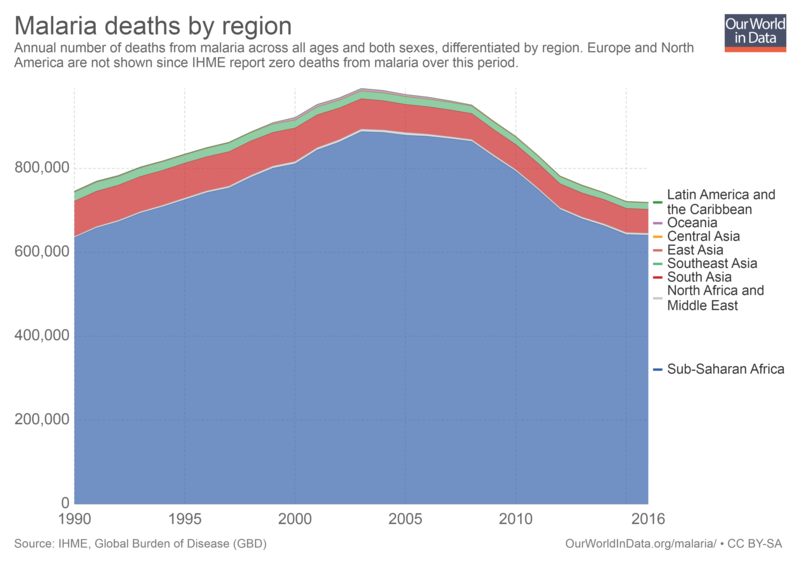 Note how malaria deaths increased steadily since 1980 (or earlier), after the banning of DDT in 1972, and how it started to decline after DDT was re-introduced. I want to personally recognize the environmental movement for the key role it played in the banning of DDT and the resulting deaths of millions of people from malaria, especially children under five years of age. After this holocaust became fully apparent, many enviros continued to oppose DDT, based on flimsy evidence and unsupported allegations. DDT was only re-introduced circa year 2000.
year and over 300 million fall sick. eradicated the disease from these areas. many areas, it was not always appropriate. necessarily ideal or even applicable to local circumstances. continued use of the chemical. add to the millions that die and suffer every year. The plot also correlates well with the decline of Chloroquine as an effective therapeutic agent and the general availability of Artemisinin from the mid 2000s. DDT became usable again against malaria because the ban stopped the huge scale uncontrolled spraying of the stuff that led to severe resistance problems, resistance that declined after the agricultural ban, used for controlled house interior spraying coupled with net use and vigorous elimination of standing water along with effective therapeutics it is a useful component of a antimalarial strategy. The ban didn’t bring Malaria surging back in the USA or Italy. Malaria levels surged in the late 1970s and early 1980s in Africa and Asia because of a complex mixture of factors, not least of which was complacency because the disease had been seen to be in retreat. 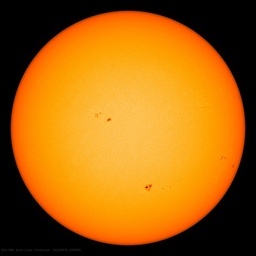 Once again skeptics are proven correct, and alarmists are proven wrong. Only if they believe their own propaganda, the increase in DDT as an agricultural pesticide was rapidly making it useless for controlling malaria because the mosquitoes were rapidly developing resistance to it. Banning it for agricultural purposes allowed its continued strategic use in dwellings to fight malaria, such as on netting or on inside walls. The resistance to DDT also confers resistance to pyrethroid insecticides so banning its use for agricultural purposes aids the fight against malaria. By the time DDT use was banned in the US (1972) it was already in decline because it had become ineffective, mostly only used on cotton crops. The data are for malaria deaths, and as noted elsewhere, may be more an artifact of treatment, etc. Are there figures for initial infection rates, or more importantly infection biogeography, as opposed to mortality? I think that would be a more telling metric with regard to climate. I found this related WHO report on infection rates. Again intervention is touted as the cause and it says nothing of climate being a factor. Through the fog of dimming memory I recall that our esteemed Mikie Mann got a grant to study global warming’s effects on the spread of malaria as a part of Obama’s economic stimulus package. Maybe one of you smart young whips can dig it up. Pretty sure I saw it here on WUWT. No, the principal investigator who got the grant was a professor of entomology who specializes in vector born diseases. Mann was one of several co-PIs who contributed a part of the research, not surprising that an entomologist would want a collaborator with expertise in climate change in such a study. 2009-2013 Quantifying the influence of environmental temperature on transmission of vector-borne diseases, NSF-EF [Principal Investigator: M. Thomas; Co-Investigators: R.G. Crane, M.E. Mann, A. Read, T. Scott (Penn State Univ.)] $1,884,991 [This needs investigated. The idea that mosquito vectored diseases would increase due to global warming was to scare Americans and Europeans. The CAGW folks claiming such was solely because they were ignorant or believed the rest of us were. My uncle born and raised in Arkansas in the 1930s had malaria as a boy. One of my bosses raised in southern Georgia had malaria as a boy. The last epidemic was in 1949 in Perry, Florida. How was it stopped? They put screens on everybody’s windows and quarantined those with the disease. Mosquito nets intended to prevent malaria are finding an unanticipated use as fishing nets all across the tropics, according to a new study.